As a self proclaimed gym rat and former amateur body-builder, I am a huge proponent of strength training for everyone, especially women. Now I know what some of you are thinking...won't I get bulky, I want to lose fat so I do cardio, I don't feel comfortable lifting weights because I don't know what I am doing. You Will Be Physically Stronger. Increasing your strength will make you far less dependent upon others for assistance in daily living. Chores will be easier, lifting kids, groceries and laundry will no longer push you to the max. If your maximum strength is increased, daily tasks and routine exercise will be far less likely to cause injury. Research studies conclude that even moderate weight training can increase a woman's strength by 30 to 50 percent. Research also shows that women can develop their strength at the same rate as men. You Will Lose Body Fat. Studies performed by Wayne Westcott, PhD, from the South Shore YMCA in Quincy, Massachusetts, found that the average woman who strength trains two to three times a week for two months will gain nearly two pounds of muscle and will lose 3.5 pounds of fat. As your lean muscle increases so does your resting metabolism, and you burn more calories all day long. Generally speaking, for each pound of muscle you gain, you burn 35 to 50 more calories each day. That can really add up. You Will Gain Strength Without Bulk. You Decrease Your Risk Of Osteoporosis. Research has found that weight training can increase spinal bone mineral density (and enhance bone modeling) by 13 percent in six months. This, coupled with an adequate amount of dietary calcium, can be a women's best defense against osteoporosis. You Will Improve Your Athletic Performance. Over and over research concludes that strength training improves athletic ability in all but the very elite athletes (See Article). Golfers can significantly increase their driving power. Cyclists are able to continue for longer periods of time with less fatigue. Skiers improve technique and reduce injury. Whatever sport you play, strength training has been shown to improve overall performance as well as decrease the risk of injury. You Will Reduce Your Risk Of Injury, Back Pain and Arthritis. Strength training not only builds stronger muscles, but also builds stronger connective tissues and increases joint stability. This acts as reinforcement for the joints and helps prevent injury. A recent 12-year study showed that strengthening the low-back muscles had an 80 percent success rate in eliminating or alleviating low-back pain. Other studies have indicated that weight training can ease the pain of osteoarthritis and strengthen joints. You Will Reduce Your Risk of Heart Disease. According to Dr. Barry A. Franklin, of William Beaumont Hospital in Royal Oak, Michigan, weight training can improve cardiovascular health in several ways, including lowering LDL ("bad") cholesterol, increasing HDL ("good") cholesterol and lowering blood pressure. When cardiovascular exercise is added, these benefits are maximized. You Will Reduce Your Risk of Diabetes. It Is Never Too Late To Benefit. 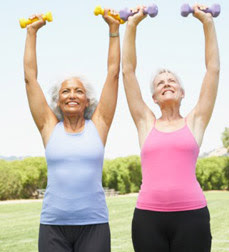 Women in their 70s and 80s have built up significant strength through weight training and studies show that strength improvements are possible at any age. Note, however, that a strength training professional should always supervise older participants. You Will Improve Your Attitude And Fight Depression. If that doesn't do it for you, much of our weight gain in our 40s and 50s can be attributed to the slow down in metabolism due to muscle loss. We lose as much as a half-pound of muscle per year after age 25 if we do not exercise to maintain it. Did you know that even Marilyn Monroe pumped iron? read more... You can do it to! Here is a great article called Weight Training 101. It walks you through some basic strength training principles and how to set up a routine. If you belong to a gym, consider meeting with a trainer for a run through of all of the machines and to learn some basic exercises. If you are working out at home, subscribe to or visit the website of a magazine like Self. They feature new exercises each month that you can try on your own. There are also tons of workout videos on the market which could offer some variety. And don't forget the old standby's...push-ups, sit-ups, squats and lunges that can all be done in the comfort of your own home! I hope you will give it a try. You might even like it! You are totally right about strength training. When I started using weights, I saw my body change dramatically opposed to just doing cardio. I had great success with a program called Group Power- you should check to see if your local gym does it because it really works!